Many Americans are living in sports limbo right now. Sochi Olympics came and went and Baseball’s Opening Day is around the corner. But for LatinoFoodie, this weekend is the most exciting sporting event of the year – The Oscars! 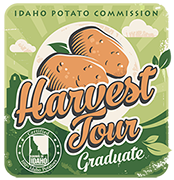 This year the competition is fierce and we can’t wait to see who wins. The Academy Awards are like the Super Bowl for the gays. We come out in full force, crowding into bars and friends’ living rooms channeling our Joan Rivers while screaming at the TV sets. It’s Oscar Night America! This year, we’re taking our menu cue from the movie houses themselves. Let’s all go to the lobby! Create a candy bar with gorgeous crystal bowls filled with your favorite chocolates and jelly beans. Think oversized martini and margarita glasses. Set-up a popcorn bar with a slew of toppings like melted garlic butter, chili powder, chocolate sauce, spiced mustard (yes, I dig mustard on my popcorn) and even some flavored salts. Take boring nachos to new heights with braised beef or marinated carne asada and fresh pico de gallo. And we can’t forget hot dogs. Take the average dog to the next level with gourmet sausages and buns. 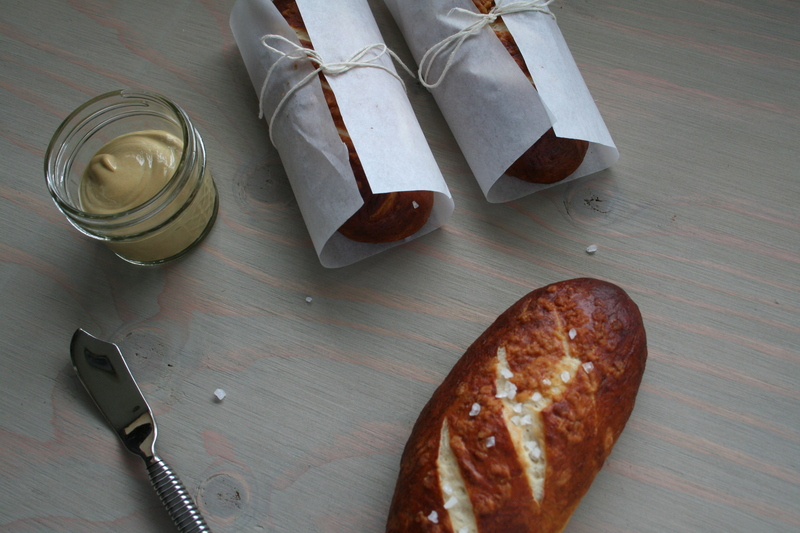 What is better than making your own bread?…eating it! 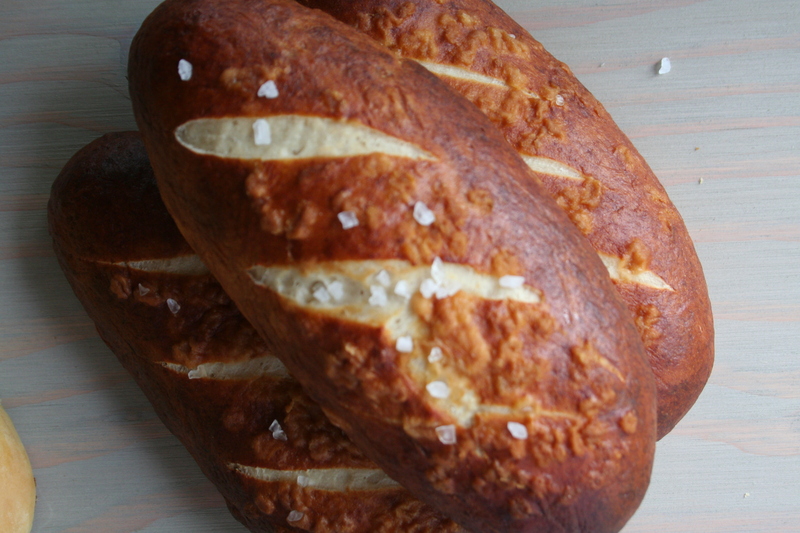 Chefs, cooks, gourmands, and restaurants everywhere have discovered the pretzel roll. 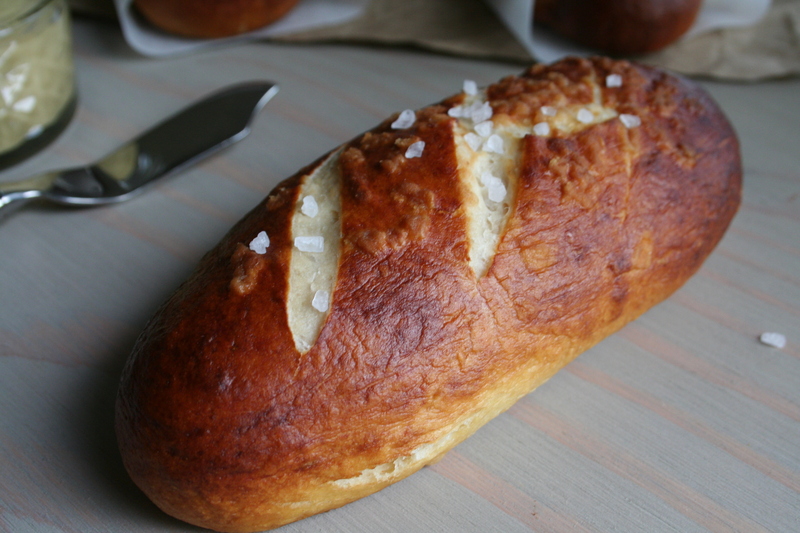 The soft and chewy yeast roll has a special place in my heart. This recipe may seem long, but it is the perfect recipe for a novice baker. Don’t like rolls? 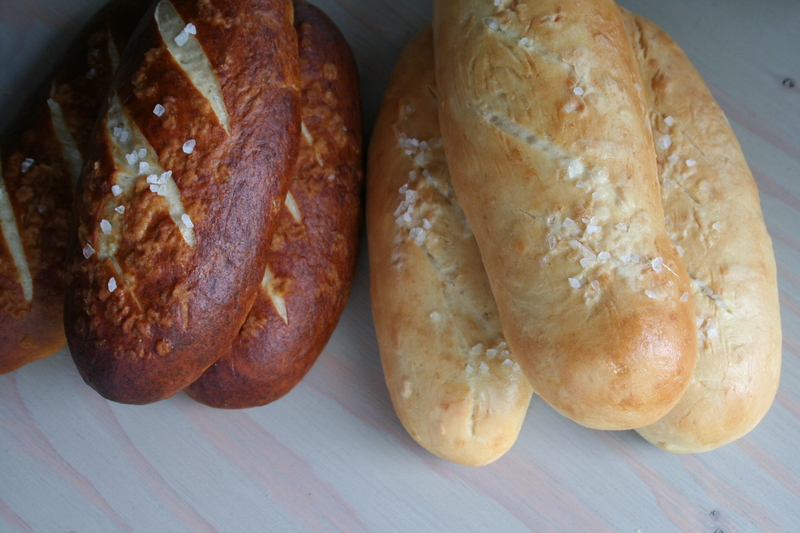 Use this dough recipe to make your own soft pretzels, hamburger buns, garlic pretzel knots, or herbed, soft pretzel sticks…and…Let’s all go to the lobby! I’ll bring the mustard. In a small saucepan heat the sugar, honey, water and milk. Using a candy thermometer, heat to 110°F. Transfer to the bowl of a stand mixer. Sprinkle the yeast over the warmed milk. Allow to sit for 10-15 minutes, until it blooms. Once the yeast has bloomed, carefully add the flour and the melted butter. Begin mixing with a dough hook on medium-low speed. Scrape down sides of the bowl. The dough should be smooth and elastic. Total mixing time is about 5-8 minutes. Meanwhile, while two baking sheets with parchment paper and spray with non-stick baking spray. Once the dough comes together, place it on a lightly floured clean surface. Shape it into a smooth ball. Cut it onto 8 equal pieces. Then form these into small balls. Place on the prepared baking sheets and cover with clean kitchen towels. Place in a warm area to rest for 10 minutes. Using the same lightly floured work surface, begin shaping the balls of dough into 7 inch logs. Place back on the prepared sheets and allow to rest for another 30 minutes covered with the clean kitchen towels. Preheat you oven to 425 °F. Move the racks so that one is on the highest position and the other is on the lowest slot. 5-10 minutes before your rolls are ready, bring 8 cups of water to boil in a large pot. When you are ready to precede, place the baking soda in the boiling water. In batches, carefully place your dough rolls in the water. Allow to cook about 20 seconds on each side. Use a slotted spatula to remove from the water and place back on the prepared baking sheets. Immediately sprinkle the salt over the rolls. This will allow the salt to stick. Cut three diagonal slits into the bread, just not too deep. Bake for 10-13 minutes. Half way through, rotate the sheets by moving the top sheet down and the bottom sheet to the top. Note: The boiling water and baking soda solution are needed to achieve the dark brown glossy color of the bread and the unique soft pretzel flavor. If you ask me why, I will just say that the bath helps to quickly denature the proteins on the surface of the dough. This helps to facilitate the Maillard reaction. Skipping this step will result in delicious pale bread, but it will not be pretzel bread. Use the photo below as a bread baking cautionary tale. Allow the rolls to cool completely. Store in a paper bag. You can also freeze them once completely cool and reheat before enjoying. They must be completely cool or you risk having soggy pretzel rolls.